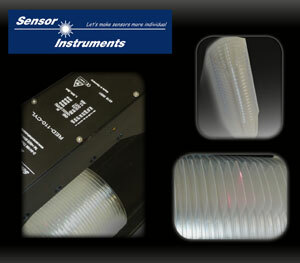 Sensor Instruments GmbH: Conventional detectors particularly reach their limits when they have to detect and count stacked transparent objects such as plastic drinking cups of plastic caps. Especially in the process of packaging, however, it is of great importance to place the exact number of objects in a packaging unit. Such problems now can be solved with the RED series (a RED-110-L was used for this application). The sensors of the RED series are so-called edge detectors which, by means of two optical detectors that are integrated in the sensor housing, under two different viewing angles detect the laser light that is focused onto the object surface by the transmitter optics and a corresponding laser diode. From the angle of the receiver that is opposite to the transmitter optics, the laser spot so to speak hides behind an existing edge, whereas the receiver that is positioned directly beside the transmitter has an unhindered view of the laser spot and due to the object edge that acts as an additional reflector even receives more laser light. It is true that the objects are transparent, but the curvature of the object edges results in a deflection of the light with a similar light-reducing effect on the detector opposite from the transmitter optics as there would be in case of a light-absorbing edge. Due to the high scan frequency of maximally 100 kHz even fast moving products are reliably detected and counted. The RED-Scope Windows® software for sensor parameterisation makes it much easier to find optimal settings for the respective product, because the Windows® user interface also provides a real-time display of the signal characteristics and of the digital outputs. When the settings are finished the parameter set is saved in the EEPROM of the sensor's integrated controller, and a copy of the parameter set can be saved as a file on the PC or PLC. An interface adapter (Profinet, EtherCAT, EthernetIP, PowerLink) of Sensor Instruments allows easy connection to a PLC.